In November 2018 HVC launched with a series of events held in cities across Australia. The launch events were hosted by Christian Ministry Advancement (CMA) (cma.net.au) and were also sponsored by Australian Baptist Ministries (baptist.org.au) and Baptist Financial Services (bfs.org.au ). Videos from some of the events are below, with the top two including the full presentation from the Gold Coast event, and the panel discussion. 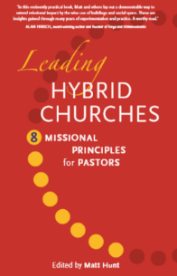 Coinciding with the HVC launch is the launch of “Leading Hybrid Churches – 8 Missional Principals for Pastors”. The book was the result of a three-day conference attended by leaders of local baptist churches across Australia from ‘hybrid churches’: churches with financially sustainable commercial ventures as part of their outreach. The focus of the conference was the leadership of hybrid churches, with the outcome being the 8 leadership principles detailed in the book. The book is not just for Pastors, but for anyone with a heart for reaching the community in the post-Christendom 21st century. To purchase a copy of the book, please email Brenda.newland@healthyvibrant.org.au. I doubt there is a better book on mission leadership for hybrid churches. The contributors to this book take us forward by not only reflecting theologically on the mission of the church today, but also by imparting their insights as leaders and mapping out key principles. A must-read for anyone interested in or considering such mission.